Colliers offers sophisticated, enterprising and innovative real estate services that facilitate client success through the skills of more than 400 professionals in New York City, northern and central New Jersey, southwestern Connecticut, Long Island and Westchester County, NY. Colliers International is the fastest-growing commercial real estate organization in the New York region. By combining the industry’s best infrastructure and innovation with diverse, recognized leaders from across the talent spectrum, the firm has the resources to assist clients via an entrepreneurial and enterprising culture that drives success each and every day. The firm’s global service platform supports and enhances metro New York’s expertise and experience, fosters the use and development of best practices and ultimately provides clients with the information and guidance for smart decision-making in the Tri-State region and worldwide. Colliers’ roots in the New York region date back to 1926. Today, the firm serves clients through the expertise of 410 professionals, including 150 brokers, in seven offices across New York City and the outer boroughs, Long Island, northern and central New Jersey, southwestern Connecticut and Westchester County, NY. Strategic corporate moves — including the recent acquisitions of project management firms Strategic Business Solutions and Gorton & Partners, Colliers International of Long Island and the recruiting of brokerage, professional, specialty and support leaders have expanded the firm’s capabilities to office, retail and industrial tenant and landlord representation; capital markets and investment services; corporate solutions; consulting; project management; valuation and advisory and property management. Colliers now manages almost 11.5 million square feet of space in the New York metropolitan region and in 2016, concluded over 940 leasing and sale transactions totaling 13.7 million square feet. Since its inception as a family-run, Manhattan real estate firm nearly a century ago, Colliers International’s New York presence has evolved through organic growth, affiliate partnerships and strategic mergers and acquisitions into a full-service organization focused on exceptional client service and committed to accelerating client success through both local expertise and Colliers’ global network. Colliers International’s New York office was founded in 1926 by real estate brokers Victor J. Cohen and William Silverman. Known as Williams & Company, the firm specialized in the loft and industrial markets, providing asset management and advisory services to banks, landlords and investors, and eventually becoming partial owner of several of the buildings they managed. Over the next few decades, Williams & Company (now called Williams Real Estate Co.) and operated by the next generation of family professionals, grew its practice to encompass both tenant and agency leasing services in the commercial office market in addition to maintaining a strong presence in the loft and industrial markets. The firm was responsible for concluding some of the largest and most significant transactions of the period in New York City. In the 1960s and 1970s, Williams continued to conclude notable leases in New York. The firm’s principals also added to their real estate holdings, acting as both owner and managing agent. Later, they expanded their activities to include partnerships in the development of two Midtown office properties and ownership in 15 other buildings. In the decades before the turn of the century, Williams saw further growth of both its services and reach in the New York region. The firm became a founding partner of GVA Worldwide Ltd., a global strategic partnership of leading real estate organizations, and created a new entity, GVA Williams, to act as the third-party brokerage and management division of Williams Real Estate Co Inc. Its affiliation with this network escalated the firm’s client service capabilities to a global level. Closer to home, Williams added Tri-State depth with new offices in New Jersey and Connecticut. In 2008, Toronto-based FirstService Corp. acquired a 65% interest in GVA Williams and the firm was renamed Williams Real Estate, a FirstService Company. For FirstService, the acquisition was a gateway into the New York market. Williams benefited from the greater capabilities of an international platform and new mortgage brokerage, asset management, project management and hotel and hospitality consulting services. To strengthen their competitive position in the evolving global marketplace, FirstService Williams and other FirstService partner firms committed two years ago to unit under a single brand, Colliers International. Colliers | New York Tri-State Region supports global and local charities that inspire our professionals and clients. From donating volunteer hours and in-kind service to cash gifts, the firm is an active corporate citizen in New York City and the greater Tri-State region, supporting diverse organizations that better our community and its people, helping the less fortunate, caring for the environment and working towards a peaceful world. Colliers' New York office has partnered with The Salvation Army for a number of years. In 2017, the firm engaged in several major fundraisers for the organization. In December, Colliers held two fundraisers for The Salvation Army. First, toys and funds valued at more than $1,000 were collected to benefit the organization's Toy Shop Program. In addition, 19 "angels," who are residents of The Salvation Army's Development Disabilities Services program's group homes, received gifts from their personal holiday lists. A bake sale in October raised money for hurricane relief for the victims of Maria, Harvey and Irma. More than $2,400-worth of cupcakes, cookies and other treats were sold to benefit The Salvation Army's efforts. Through the power of entertainment, Red Nose Day raises awareness and money to help kids in need. On May 25, 2017, Colliers’ New York staffers donned red noses to support projects that ensure kids are safe, healthy, educated and empowered in all 50 states and poor communities in Latin America, Asia and Africa. David Amsterdam is President, Investments and Eastern Region | Co-Head, US Capital Markets for Colliers International. He leads the teams in top-tier cities, including New York, Boston, and Washington D.C., with added responsibility for managing and executing transactions in critical global markets. 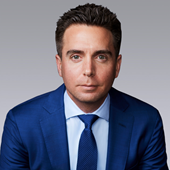 His responsibilities include advising investors, corporate users, and landlords across the full spectrum of commercial real estate transactions and he is focused on continuing to drive revenue for the fastest-growing publicly traded real estate services and investment management firm in the world. I am Colliers International’s Senior Finance & Operations Manager for the New York Tri-State Region. As such, I oversee the finance and operations functions for the firm’s New York City, northern and central New Jersey, Long Island and southwestern Connecticut offices, providing financial insight and analysis from both revenue and expense perspectives; leading forecasting and budgeting; and managing the pipeline process in close coordination with office and brokerage professionals. I joined Colliers in 2017. I have almost 20 years of experience in commercial real estate. Prior to joining Colliers, I was Director, Brokerage Services for Cushman & Wakefield’s Long Island, Stamford, CT, White Plains, NY, and Brooklyn and Queens, NY markets for 11 years. I had accounting, budgeting, forecasting and other financial responsibilities similar to those I now hold at Colliers in that role, and also managed operational and administrative activities including issue resolution, broker on-boarding, real estate licensing, IT/employee interaction and facility management. Before Cushman & Wakefield, I held research-related positions for the New York City and Long Island markets at CBRE and Insignia/ESG (prior to their merger). I earned leadership of the firm’s 15-person New York City Research team for the final two years of my time at the firm. I was a research specialist at Interactive Data Corporation before entering the commercial real estate industry. Dennis Waggner is the Executive Managing Director, Market Leader for the New Jersey Region. In this role, Dennis leads the three New Jersey Offices in growth initiatives, running all operations, ensuring operational efficiencies and in providing best in class support to our brokerage professionals. Dennis brings a wealth of industry experience to Colliers. In his prior role, Dennis was the Senior Director of Operations at Avison Young for the Tri-State Region. Prior to that, Dennis spent most of his career at Cushman & Wakefield, Inc where he was most recently the Senior Managing Director of Operations for the Tri-State and New England Regions. In this role, Dennis handled 16 offices with over 400 brokerage professionals. Prior to that, he was an Account Representative in the Property Management Division overseeing an assortment of properties for his clients. Need more information about Colliers | New York Tri-State?